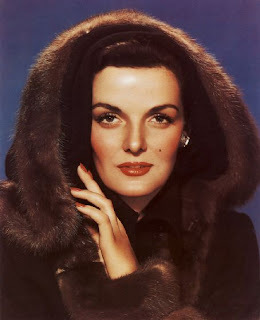 Rooftop Reviews: Happy Birthday Jane Russell! Happy Birthday to Hollywood legend Jane Russell. Born in Minnesota on June 21, 1921, she was an "Army Brat" and moved to California after her Dad retired from the Army sometime prior to 1940. She attended Van Nuys High School in Los Angeles before working as a receptionist in a dentist office. It was there that she was first noticed by one of the patients, Howard Hughes. She had been to drama school, and at the urging of her mother, as well as Howard Hughes, she was signed to make "The Outlaw" in 1941. The film would not be released until 1943 and launched her career in film. It would be 5 more years until she made another film. Hughes had her under a 7 year contract and featured her only in films that showed off her body and not her talent as an actress. In 1952 she was starred opposite Robert Mitchum in the classic film "Macao." She plays a woman traveling from Hong Kong to Macao who does a little bit of "grifting" to get her through the lean times. When Robert Mitchum sees her in a violent altercation with another man, he steps in to help her and a reluctant alliance is formed. The film, produced by Joseph Von Sternberg, also features legendary character actor William Bendix, who plays a police detective on the trail of some jewelry smugglers that have murdered a policeman in New York City. Robert Mitchum is mistakenly identified by the smugglers as the undercover detective and targeted for death. Feeling guilty about having picked his pocket, which leaves him with no proof of who he really is, Ms. Russell, now employed as a singer in the gambling club owned by the smuggler, is compelled to come to his aid. This puts both of their lives in jeopardy and forms the basis of their relationship, which turns romantic. In this film, as well as the "Las Vegas Story", co-starring my favorite piano player/songwriter Hoagy Carmichael, Ms. Russell gets to show off her talent as a singer. This is a link to the two songs from the film "Macao", the first being "You Kill Me." Watch her as she moves to the music and check out those eyes! This is one of my all time favorite movie songs. I have it on my flash drive and listen to it frequently in the car. In 1953 Ms. Russell forever cemented her name in show business history with her role opposite Marilyn Monroe in "Gentlemen Prefer Blondes." In 10 years she had made the transition from a $50 per wek contract player to a $400,000 fee playing a lead in one of the most famous movies of all time. A "Born Again" Christian for decades, she lives today in Santa Maria, California. She is very vocal about her political views, which are Right Wing and Conservative. She describes herself as being "politically uncorrect." Her candor has not diminished with her age and she still finds herself viable in the field of entertainment. Both her political views and personal story are well chronicled in the self penned autobiography "My Path and My Detours." The book was released in 1986. Married 3 times, Ms. Russell retired to Santa Maria, California in 1999 after the death of her third husband. This move also allowed her to remain close to her youngest son. In 2004 she met with Leonardo DiCaprio, at his request, to learn more about the real Howard Hughes, whom he was about to portray in "The Aviator." And as late as 2006 she was still putting together local shows for the seinor citizens in Santa Maria. Happy Birthday Ms. Russell. You have given us a whole lot of entertainment to look back upon and enjoy. And "Macao" is still one of my all time favorite movies.